The seven messages are on BOTH the cassettes and the CDs plus in the book. 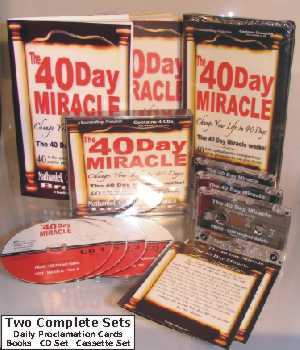 There are two complete 40 Day Miracle programs in each set, one complete cassette set and one complete CD set and a book and a Daily Proclamation scroll to go with each. The price is $40 for the entire package. "Why are there two complete 40 Day Miracle programs in each package and why can't I buy them separately?" Because you must give one away and help someone else, that's a part of The Miracle. Most have a CD and cassette player. Consider that the price of the three cassettes or four CDs is usually $20 or more and the book is $20, so think of it as a buy one get one free but the entire package is $40 and it cannot be bought separately. 1. You can read it from the book. Many prefer to read instead of listening on the Internet. 2. If you have no sound on your computer or for some reason can't play the messages (such as your computer access is at work). 3. The sound quality is better from the CD or Cassette. Although the Internet sound is good, the sound is better from the CD and cassette. 4. Giving The 40 Day Miracle helps you. Each package contains two complete programs or FOUR programs if you just give each friend just a book OR a cassette or CD set. It takes the burden out of finding birthday, graduation, or holiday gifts. Each book, CD and Cassette set is individually pre-priced at $20 each. Plus, giving is a part of The 40 Day Miracle. 5. You get two printed Daily Proclamation Cards. 6. The book has a daily log/journal for you to record your experiences and observations. 7. You can listen in your car or without the Internet. 8. Makes an awesome gift. Those who receive it will be blessed. If they follow The 40 Day Miracle, their lives will be changed. Most gifts, unlike The 40 Day Miracle, are quickly forgotten. 9. There are extra talks and comments on the Cassette and CD set that are not on the Internet. 10. Your purchase will help support the mission. A vast number will be blessed by The 40 Day Miracle but only a very few will make a purchase or send a donation to help. You become one of the few. You become one of those who helps to spread miracles instead of just seeking a miracle.